Rabies is a viral infection of animals that can be transmitted to humans. It is caused by a virus of the Rhabdoviridae family, which attacks the central nervous system and eventually affects the brain. The virus is usually found in the saliva of an infected animal. Rabies is almost always fatal once symptoms occur. Rabies can occur in any warm-blooded animal, domestic and wild- commonly, dogs, cats, foxes, raccoons, skunks, wolves and bats. Animals having potential interactions with people such as cattle and horses can acquire rabies and may transmit the disease to humans. Rabies is a viral infection that affects the brain and is spread by direct contact with an infected animal. It is a fatal disease found on all continents, except Antarctica. Pre-exposure immunization of rabies vaccine, Imovax includes 3 doses. The Rabies Vaccine Imovax is available at the travel vaccine clinic but supplies are limited due to a vaccine shortage. Please call the clinic in advance at 416 461 2419 to confirm availability of the vaccine. Rabies is a deadly illness caused by a Lyssavirus that spreads to humans through close contact with the saliva of an infected animal, most often from licks, bites or scratches. Your risk depends on several factors: your destination, the length of your trip, where you stay, your activities and your access to medical care. Your risk is much higher if you participate in activities that put you in close contact with animals, such as cave exploration, hunting, camping, hiking, or cycling. Travellers who will be working in close contact with animals (for example, veterinarians, animal control or wildlife workers or laboratory workers) are at higher risk. Children are also considered at higher risk because they often play with animals, are less likely to report bites or scratches and are more likely to be bitten in the head and neck area. In many areas of the world, rabies is most common in children under the age of 15. Rabies can be carried in any warm-blooded animal (domestic or wild). Rabies is spread from an infected animal when the virus from its saliva enters the victim’s nervous system through a bite, scratch, or lick on open skin or mucous membranes (eyes, nose and mouth). Symptoms generally take one to three months to appear, but this may vary considerably from several days to several years. Early symptoms are flu-like, including headache, feeling generally unwell, fever, and fatigue. There may be discomfort or pain including tingling or numbness at the exposure site (i.e. bite). “Furious rabies” is more common, and is characterized by anxiety, confusion, hyperactivity, hallucinations, fear of water (hydrophobia) and seizures. Once symptoms appear, rabies is almost always fatal. In both “furious” and “dumb” rabies, death usually occurs within seven to fourteen days due to breathing failure caused by paralysis of the respiratory system. If you have been exposed to the virus (bitten or scratched), shots (called post-exposure prophylaxis) can be effective at preventing the disease, as long as they are received as soon as possible. Post-exposure prophylaxis is available worldwide, but it is often difficult to obtain. There is no specific treatment for rabies once symptoms appear. Where is rabies a concern? Rabies occurs worldwide except in Antarctica. Most human deaths occur in Asia and Africa and the disease is mainly transmitted by dogs. There is a high risk of rabies in Central and South America and the Caribbean. Bat rabies has recently re-emerged and is a concern in Australia and Western Europe. Bats are the source of most human rabies cases in North America. 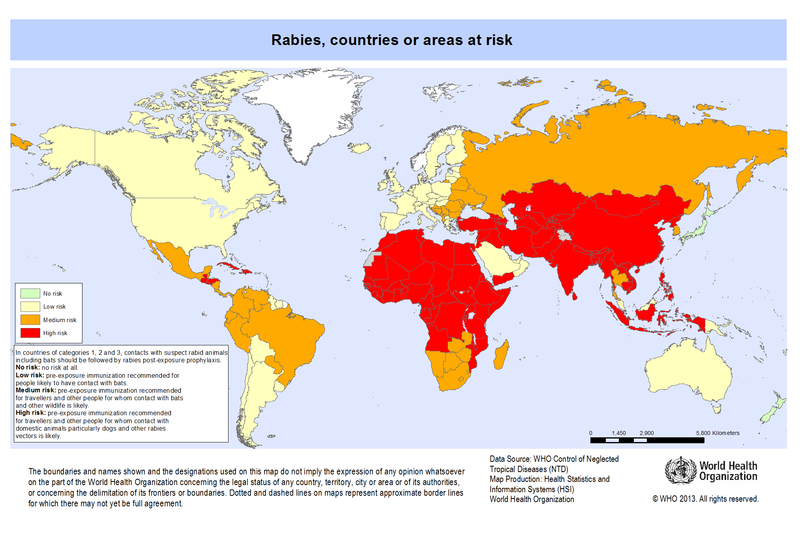 A map of the areas where rabies transmission occurs is available from the World Health Organization (WHO). Travellers should consult with a health care provider to discuss their travel plans and activities. The rabies vaccine should be offered to people at potentially high risk of contact with animals. Vaccination should also be offered to travellers going to areas where rabies is widespread and there is poor access to medical care. Vaccination should be offered to children who are too young to understand either the need to avoid animals or to report contact with animals. 2. Take personal precautions to avoid contact with all animals, wild or domestic. attempt to pick up, pet, feed or handle unfamiliar animals. attract or approach wild or stray animals. handle bats, including if inside caves, or spelunking. Always closely supervise children around animals, especially dogs, cats and wildlife such as monkeys. Immediately clean the wound thoroughly by washing and flushing with soap and water for at least 15 minutes. Immediately seek medical assistance to assess your risk and discuss treatment options. When you return to Canada, see your health care provider and tell them about your exposure and any shots you may have received. Source: © All rights reserved. Rabies. Public Health Agency of Canada, modified in 2016, with permission from the Minister of Health, 2017.